Moving In Update and Fresh Peas! Moving at our age is certainly not for sissies!! Been a lot of years since we have worked this hard, but along with sore muscles we now have so many projects accomplished to make our little country ‘shambles’ our perfect little farmhouse. Roy has worked everyday building projects which pop into my head to make the tiny kitchen much more work-friendly. Pictures will follow later…. My small kitchen garden that will see us through this first summer is planted and growing wonderfully well – I’m already able to cut a few leaves of various lettuce and herbs to add to salads and I can almost see the zucchinis, tomato and pepper plants growing every day! Won’t be too long. Yesterday was a food-filled day! Finally had all my smoking equipment unpacked and some chicken thighs dry-rubbed overnight ready for the smoker. Also, adding to the feast, friends (thank you Gary & Guimi Prater) had given me a bag of fresh peas from their garden which were delicious sweet to munch on as is. But, I did get them hidden from me in the fridge to be used in a dish of some sort. 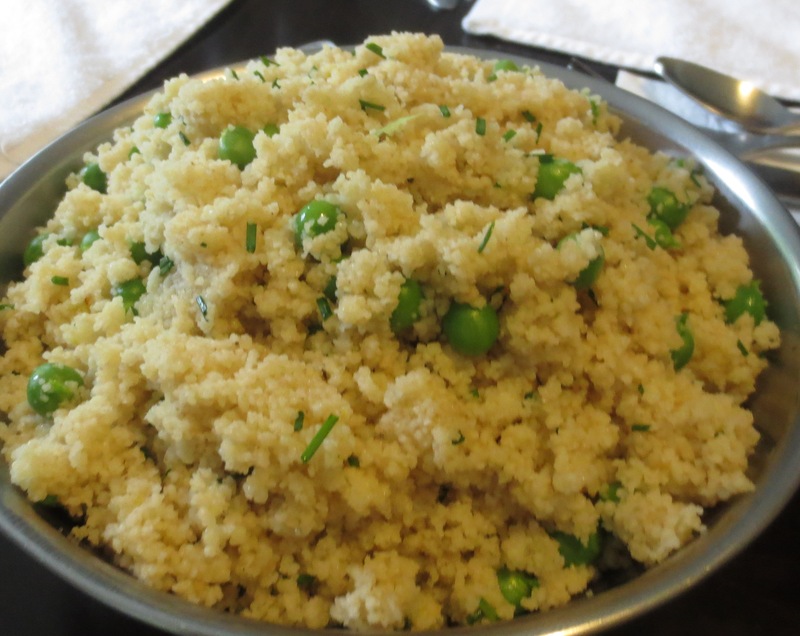 Couscous with Peas and Chives was the perfect choice to allow the peas to shine. And, a reviewer of the recipe’s method was just the right way to prepare the dish. (Add couscous to a 4-cup measure, top with the shelled peas; after bringing chicken stock, pinch of saffron, and butter to a boil, pouring it over the couscous. Let sit 5 min. covered and the dish is ready. 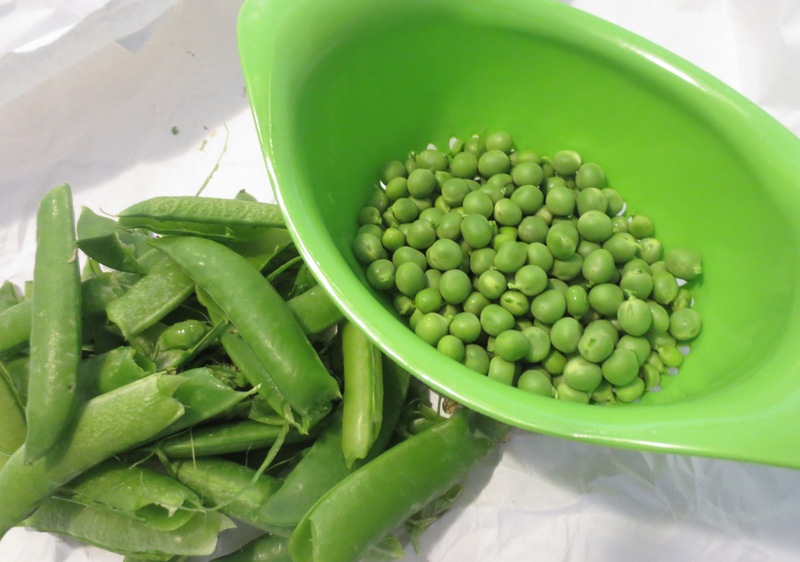 I have to say this turned out to be the best way to cook (using the term loosely J ) peas I’ve ever done – the peas were still their vibrant bright green and texture was a crisp-cooked result tasting like they had just come from the garden. The smoked chicken thighs were very tasty also, but since I’m not a fan of overly smoked food, next time I will pull them after two hours of smoking and finish off in the oven if necessary. But the flavors of the rub and baste were spot on heat-wise and still very tender and moist. And, to top the day off, our friend the Pie Lady, Kate McDermott, stopped by with a Rhubarb Custard pie to taste test! Loved her version, especially with the addition of sugared pecans scattered over the top – I wanted more of the crunch! So very good. It’s very hard not to eat well with the friends and neighbors we are lucky enough to have here in Port Angeles. 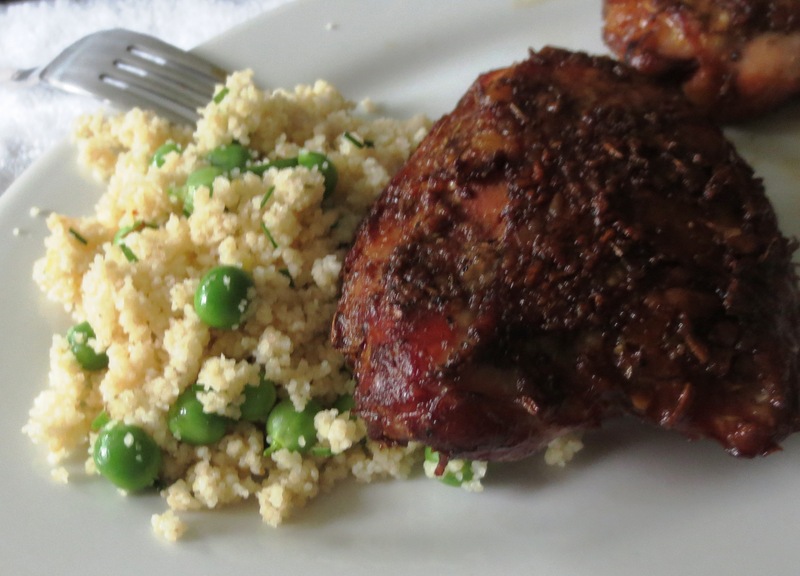 Pour the couscous into a 4-cup measure and top with the peas. Bring the brother, butter and saffron threads to a boil and pour over the couscous/pea mixture to cover completely. Cover and let sit for 5 minutes. Remove cover, transfer to a serving dish fluffing the couscous and gently adding the chives to the mixture along with salt and pepper. Taste for seasoning. This dish is so versatile, I’m anxious to try switching up the herbs and using basil, rosemary, maybe even a few leaves of mint and/or cilantro. The mama-to-be doe we have been watching evolved into an entire herd this morning – Thank heavens my tender little beginning garden was well protected. Happy cooking and enjoying the fruits of your labor everyone! I’d love to hear from you with any additional ideas for this dish – it just calls for playing with.